It was when Granit Xhaka and Xherdan Shaqiri celebrated their goals with the Albanian eagle salute that you knew just how much beating Serbia meant to them. Two players of Kosovan descent not only put Switzerland on the brink of the World Cup knockout stages but they struck a blow for the nation the country they were playing still refuses to recognise. Whatever Arsenal fans think of Xhaka, surely not even they would begrudge him what must have been one of the most emotional goals of this World Cup, with his father having been imprisoned for campaigning for the independence of Kosovo. That kept Switzerland's Group F destiny in their own hands before Shaqiri put them firmly in control of it and left Serbia needing to beat Brazil to reach the last 16 for the first time since their country became independent itself. 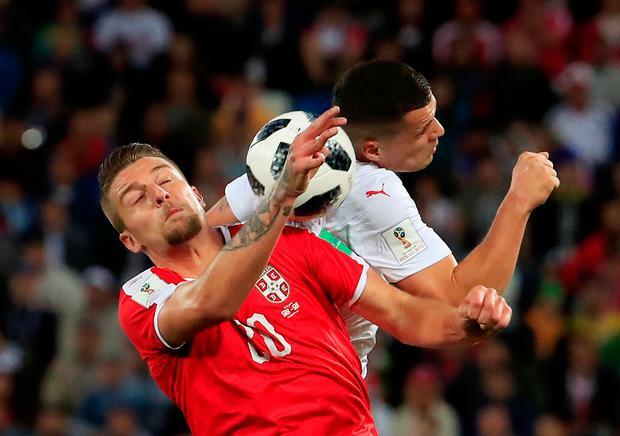 The first meeting of these two countries since the collapse of Yugoslavia had long been billed as a grudge match, given two of Switzerland's players were born in Kosovo - the former Serbian province its former overlords still refused to recognise as an independent state - and a third's family was forced to flee there. The most faithful of them to his heritage, Shaqiri, even speaks Albanian at home and has long worn boots bearing the flag of both his adopted country and birthplace, an online picture of which last month prompted a caustic response from Serbia striker Aleksandar Mitrovic. As well as earning their country a Fifa fine for a World War II era banner in their World Cup opener in Samara, Serbia fans could apparently be heard singing "Kosovo je Srbija" (Kosovo is Serbia) in the city's bars. In Kaliningrad - a place with its own complex history of nationhood - they made their feelings clear by jeering Switzerland's Balkan-blooded players from the moment their names were announced over the public address. Xhaka tried to silence the catcalls with the first shot in anger but Serbia's fans were celebrating at the other end inside five minutes. 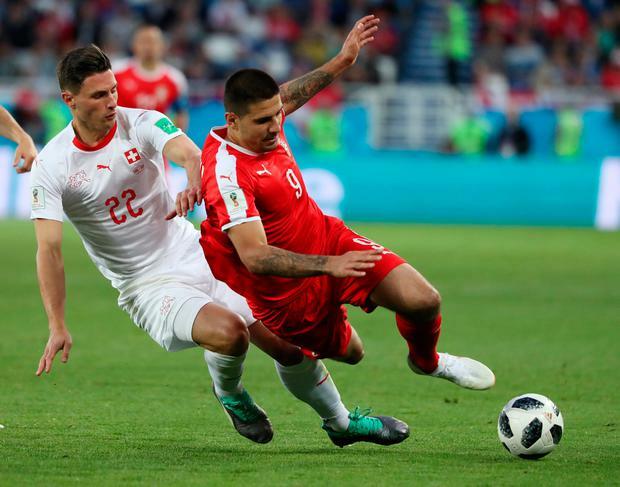 Switzerland failed to learn their lesson as, first, Mitrovic climbed highest to connect with a header Yann Sommer did well to repel, before the Newcastle United striker outmuscled Fabian Schar to power home Dusan Tadic's cross moments later. Another Balkan-born Swiss, Blerim Dzemaili, screwed wide from Ricardo Rodriguez's cutback but Mitrovic was winning almost everything in the air, wreaking enough havoc for Aleksandar Kolorov to go close to a second goal. Mitrovic also saw fit to barge into the back of Shaqiri in what was a visible reminder of the bad blood between them. Switzerland's defensive game plan, just days after they managed to keep Brazil at bay, was proving one of the great mysteries of the World Cup. But they soon began exposing holes in their opponents' back line and would have equalised after half an hour but for a superb reflex save from Vladimir Stojkovic. Steven Zuber's brilliant through ball was met by a first-time finish from Dzemaili, who wasted another promising attack moments later when almost sent clean through by Shaqiri. The problem was Switzerland looked like conceding from every high ball and would have done from a corner had Dusko Tosic not failed to connect with a free header and had Nemanja Matic been able to turn in the loose ball. Needing a goal to avoid having to cheer on their opponents against Brazil on Wednesday, they threw on Mario Gavranovic at half-time for the ineffective frontman Haris Seferovic. And they got it within seven minutes thanks to Xhaka, who produced the kind of strike to leave Arsenal fans blinking in disbelief. They had only just avoided conceding from another Mitrovic header from a corner when they launched an attack Kolarov seemed to repel only for the ball to fall for Xhaka to lash it home left-footed first time from 20 yards. Mitrovic had a furious penalty appeal turned down after a tangle in the box before an offside flag spared Mario Gavranovic's blushes when he fired wide after being put through by Shaqiri. Breel Embolo tried to provide it with a long-range strike straight at Stojkovic. But given the politically-charged atmosphere, the clincher seemed destined to come from a Balkan and it was Shaqiri who provided it in stoppage-time. Serbia were on the attack when the play was switched forward to the Stoke City winger, who stayed onside by remaining in his own half and out-sprinted his pursuer before slotting under Stojkovic.